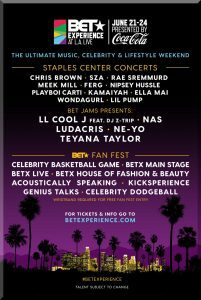 BET EXPERIENCE AT L.A. LIVE TAKES PLACE JUNE 21st – 24th, The four-day event will showcase the best in music and entertainment. The first group of presenters who will take the stage at the BET Awards 2018: T.I., Kevin Hart, LL COOL J, Chloe x Halle, Yvonne Orji, Bobby Brown, Trevor Jackson, Jason Mitchell, Mike Colter, Woody McClain, Jacob Latimore and Gabrielle Dennis. The BET Awards 2018 will premiere around the world on BET’s international networks. It will air in the UK on June 26th at 9:00 PM BST, in Africa on June 26th at 8:00 PM CAT, in France on June 26th at 9:00 PM CEST and in South Korea on June 26th at 9:00 PM KST. Internationally, fans in 100 countries can also stream the BET Awards 2018 live with BET Play, BET International’s subscription video on demand application. The iOS and Android app, which also features current and classic BET television series, documentaries, stand-up comedy and legendary musical performances, will carry a live feed of the red carpet and the Awards, and is available for download now in the iTunes and Google Play stores for $3.99 a month following a seven-day free trial. Connie Orlando, Executive Vice-President, Head of Programming at BET will serve as Executive Producer for the BET Awards 2018 along with Jesse Collins, CEO of Jesse Collins Entertainment. The “BET Awards” 2018 will take place along with the BET Experience at L.A. LIVE in Los Angeles from June 21-24, 2018. BET.com/betawards is the official site for the “BET Awards” and will have all the latest news and updates about this year’s show. Full package amenities and pricing for the Diamond, Platinum, Gold Plus and Gold VIP Packages can be found by visiting BETExperience.com or by calling (877) 234-8425.